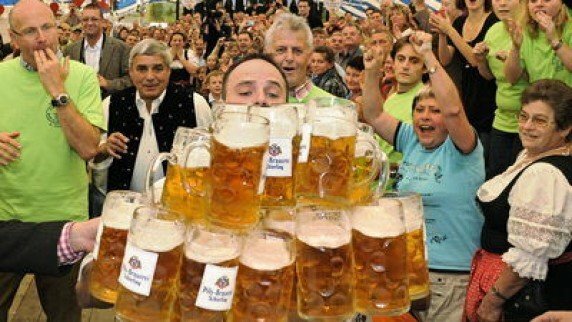 Oliver Struempfel set a new world record in beer-mug-carrying on September 7, less than two weeks before the start of Munich’s famous Oktoberfest. Oliver Struempfel, a 38-year old tax inspector from Abensberg, Bavaria, managed to carry 27 full one-liter beer mugs – or “mass” as they are known in German – over 130 feet. He works at the Gillemoos festival in Abensberg and took on the beer-carrying challenge after months of training. “I have worked here in the beer tent for the past 17 years, so I have lots of training,” Oliver Struempfel told Reuters after winning the competition at the local Gillamoos beer festival. Each mug weighed approximately 5 pounds.